In some parts of King County, including Bellevue, Federal Way, Renton and Sammamish, the measure to expand arts, science and cultural programs was opposed by at least 60 percent of primary voters. Seattle’s appetite for new sales taxes remained hearty in the Aug. 1 primary, with 64 percent of city voters opting to tax themselves to expand arts, science and cultural programs to a broader swath of the county’s residents. But opposition around most of King County sunk Proposition 1, 50.9 percent to 49.1 percent. 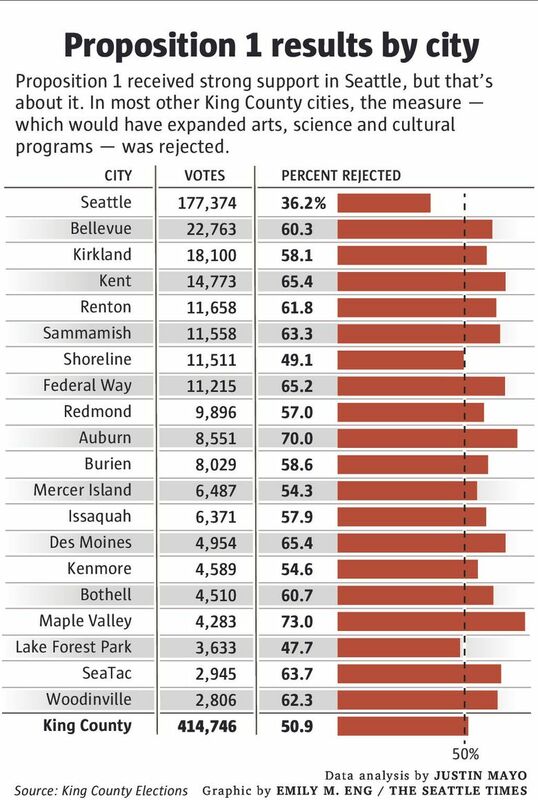 Outside of Seattle, the measure drew majority support in only three cities: Lake Forest Park, Shoreline and Skykomish. In some areas, including Bellevue, Federal Way, Renton and Sammamish, the measure was opposed by at least 60 percent of primary voters. Black Diamond threw down with a “heck, no,’’ with 75 percent of voters rejecting the measure, making the city the most anti-tax in King County this election. Prop. 1 sought to increase the sales tax by 0.1 percent — or a penny for every $10 spent. Arts organizations spent $1.7 million to support the measure, but opponents argued there were more pressing concerns in a county where homelessness and affordable housing have become crises. Large arts organizations were expected to receive most of the funds from the measure, which would have required them to provide free and low-cost admissions for arts, science and cultural programs and venues. Under Prop. 1, they would have been required to bring activities to the suburbs and rural parts of the county. Turnout in Seattle was much higher than the rest of the county, likely due to the mayor’s race, which pulled in a field of 21 candidates. Overall, turnout countywide was 34 percent. In Seattle, it was 40 percent; outside the city, it dropped to an average of 30 percent. Pacific, with its 3,287 registered voters, had the lowest turnout with only 18 percent of voters casting ballots. The greater turnout in Seattle nearly pushed Prop. 1 over the top. That’s not surprising given that Seattle was the only city to support two other ill-fated countywide sales-tax proposals since 2010. Prop. 1 drew more support in places where turnout was higher. There were notable exceptions, however: Magnolia, parts of Redmond/Woodinville, Broadview and precincts along Burien’s waterfront.